In recent years, the importance of education for entrepreneurship has been increasingly recognized, and so every year more schools are defined as educators for entrepreneurship and leadership. In addition, there are the schools open a course/study group on entrepreneurship. The Entrepreneurship for Kids Program encourages this trend and enables each school to implement its program and encourage its students to succeed. This is a map of Entrepreneurship for Kids Program in schools throughout Israel. Clicking on the coordinates on the map will display the name of the school that implemented the program and the school logo. 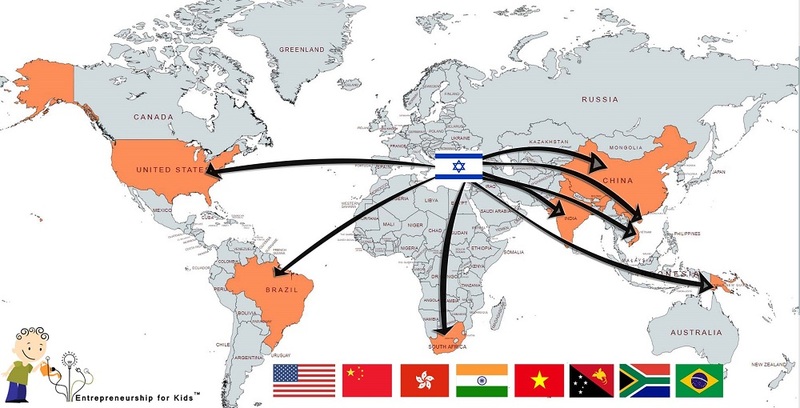 Countries around the world, which are aware of the achievements of the State of Israel as an innovative and entrepreneurial country, aspire to learn from it. This map shows countries that teach the EFK program from an early age, in order to instill students life skills and prepare them for the changing labor market. Read more about the implementation of the program in the USA, China, Hong Kong, Vietnam, and Botswana. Read here about the Entrepreneurship for Kids Program and about the importance of entrepreneurship education from an early age.